Japanese cuisine, unlike Italian or French, somehow has never appealed much to me. Over the years of blogging, traveling and trying different types of Japanese food, I still tend to (unconsciously) associate Japanese cuisine with seafood, raw and unprocessed ingredients. These are the ultimate combos that a much younger 'me' would loathe and choose to starve herself rather than eating that. But that's not who I am today. I've become much more open and accepting about food and learn to appreciate the story that goes behind every single grain of rice on my plate. 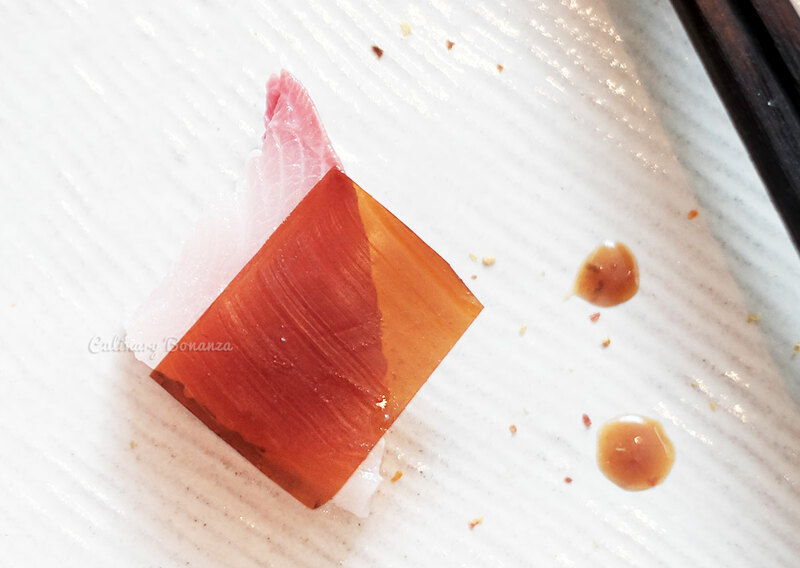 But what has it got to do with this post anyway, well I'm trying to reiterate that there are plenty of premium high end Japanese restaurants in town, but only a few actually got me quite excited like this one, OKU Japanese Restaurant at Hotel Indonesia Kempinski Jakarta. My excitement might be premature, so the naysayers would think. I certainly hope not. 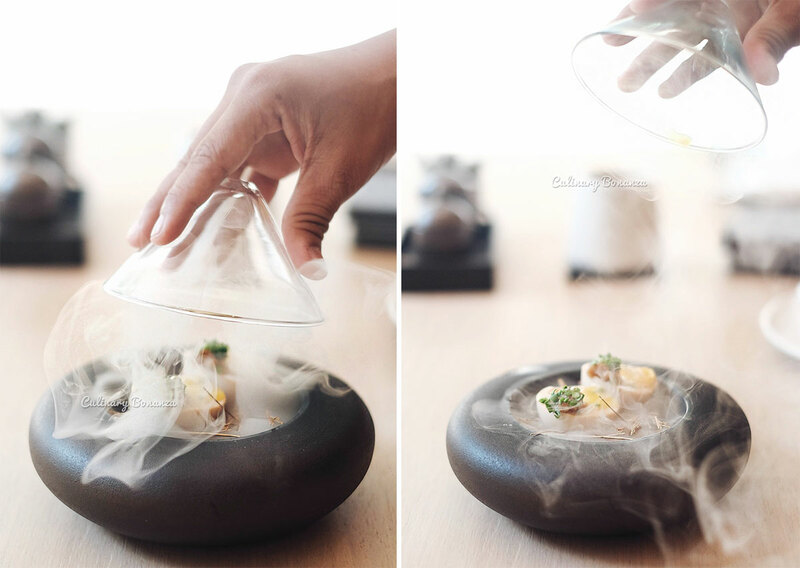 On its bio, OKU claims to be a premium Japanese dining venue, helmed by Chef Kazumasa Yazawa. OKU promises the patrons who can afford it a modern take on Japanese dishes combined with traditional flair, which, when combined with its Zen-like atmosphere and laid-back jazzy vibes. After my first visit there just yesterday, I can positively attest to all that. Firstly, the premium Japanese dining venue with its Zen vibes is clearly apparent from the moment one enters the venue. The interior of the restaurant is dominated with wood in light pastel colours, occasionally interrupted by simple yet symbolic decoration elements such as the 2 golden rocks (symbolizes wealth and the premium-ness of the place, perhaps) and a bonsai pot on the counter at the entrance. As one walks further in, there are 2 metal crane art installation hanging from the ceiling, which appear to capture the iconic Japanese birds mid-flight, ascending from the water below. Crane symbolizes happiness, good luck and peace in Japanese culture. In general, one will feel calm from the simple yet soothing interior, no matter where you are seated. The 2 private rooms (minimum spending applicable) promise privacy, but I would much rather request to be seated at the 'semi private area' at any given chance. It's the area with floor-to-ceiling windows at furthest side from the entrance. Like a lot of modern restaurants lately, OKU has an open kitchen, so guests could watch the chefs in action. Unlike the rest of the restaurant, the bar takes a darker and bolder approach, with darker furniture used as well as the solid granite bar counter. The bar has slightly later closing hours than the restaurant, so guests could simply move here after they finish their dinner late. The name OKU itself implies the peeling back of the layers of an onion, representing the culinary journey that diners will experience at the outlet while savouring these "life stories". It implies multiple layers of meaning, experience and discovery. And for me, that journey of discovery started with Ajitama. Theatrical presentation? Checked. Beautiful plating? Also checked. The smokiness of the egg was apparent without being overbearing, I just wished the shiguren beef would've tasted a little stronger. But all in all still a good starter for the next dishes to come. Usuzu Kuri definitely has got to be one of my few personal favourite carpaccios, and I especially love the truffle ponzu dressing. 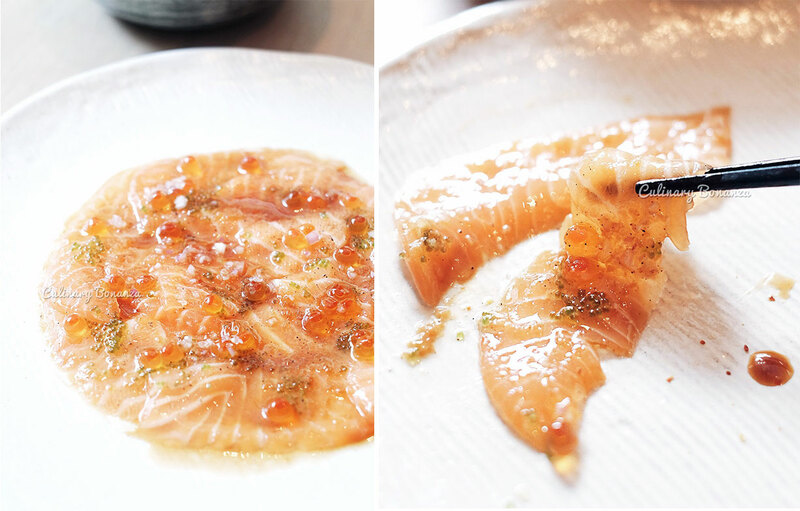 Unlike at other places I've been to, the salmon trout carpaccio's cut is slightly thicker and topped with juicy ikura that pops in the mouth leaking the rich & umami liquid that I believe is the flavour essence of the ocean. A few drops of truffle oil surely enhanced the experience and I wouldn't complain at all. OKU's Chicken Katsu defies all conventional characteristics of a 'katsu'. Would you have guessed what it was from the above photos? The black batter is made from squid ink, hence the colour. Then the type of batter, instead of the usual 'panko' blanket, this one is smooth. Apparently the batter serves a purpose as a 'case' to keep the molten sauce & fillings together. Just be careful when eating this, because some of the fillings may unexpectedly squirt out. An experience at a premium Japanese restaurant is only complete after trying the sashimi, so I tried the 3 types sashimi. The sashimi came on a bed of assorted seaweeds, angel hair, gracilaria and sea grapes. 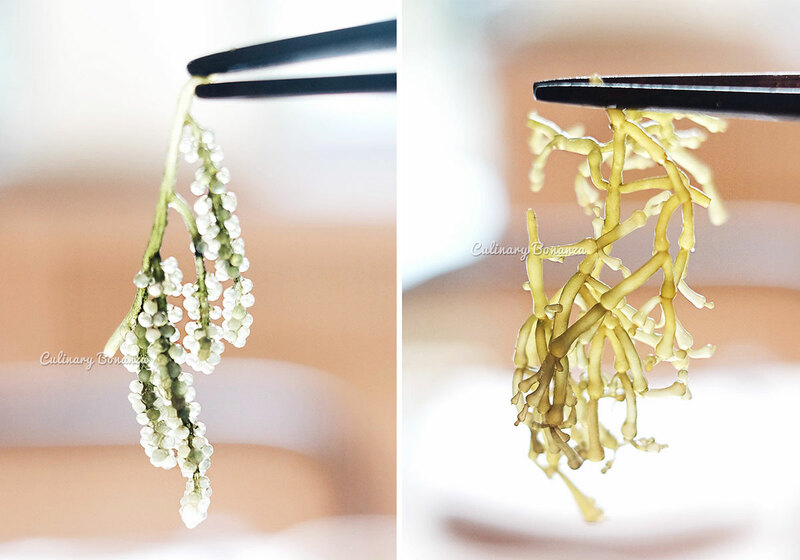 Out of curiosity, I tried all of them and concluded that sea grapes are my favourite and actually taste quite good as a snack, the gracilaria's very crunchy and the least palateable is the angel hair seaweed, which has got some queer flavour that I can't quite describe. As for the sashimi, I got 2 slices of sake or salmon, 2 slices of akami (the reddest and leanest part of tuna, the 'commoner' tuna, if you wish to call it) and 2 slices of kanpachi or amberjack. For the price, I suppose, the akami should've been otoro (the fattiest and most prized part of tuna) instead. At most Japanese restaurants that I've been to, including some of the ridiculously expensive ones, the dessert are often plain simple & don't require much preparation (if at all), like mochi, fresh fruits, matcha / ogura ice cream. So as a dessert lover, I'm absolutely impressed when that came to my table. Other fine dining restaurants in Jakarta charge a lot more than this for some plain boring pannacotta or lava cake. So in my opinion, this dessert is totally worth the price compared to those. The Yuki would easily fit in the menu at any fancy western restaurants, it's a beautiful combination of the bittersweet dark chocolate & and refreshing sour of the uniquely scented yuzu orange. Plus, the dessert is a lovely combination of colours and textures, having the shiny edible gold papers didn't hurt at all.